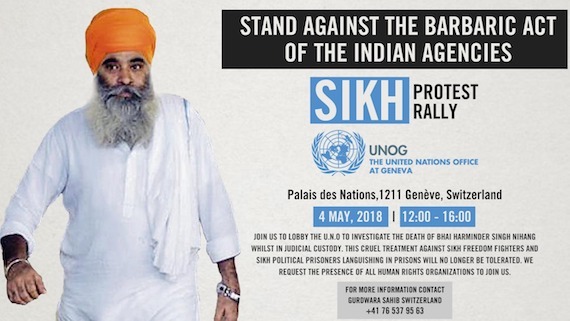 London: Sikh activists from across the globe are set to hold a protest rally outside the UN office in Geneva on Friday 4 May 2018 between 12 noon and 4pm. “The main focus of the rally is to call for UN action against India for the killing of Harminder Singh Mintoo, a well know Sikh activist and freedom fighter, while in judicial custody in Patiala jail on 18 April 2018”, reads a statement issued by the Sikh Federation UK, a UK based Sikh activists group. Bhai Harminder Singh Mintoo was deported from Thailand to India in November 2014 where he had been in custody. “Although it has been reported he suffered cardiac arrest many have raised concerns and expressed doubts about the circumstances in which he died and the denial of basic medical facilities that he raised with his family prior to his death”, the statement reads. Advocate Jaspal Singh Manjhpur, who was lawyer of Bhai Harminder Singh Mintoo has been maintaining that Bhai Mintoo was killed under ‘state conspiracy’. He said the jail warden ignored the advice and recommendations of the jail doctor to get Harminder Singh examined from PGI, Chandigarh suggesting a state conspiracy to kill him that has been repeated by his family members. As per information Sikh Federation (UK) has also arranged for Sikh representatives to meet staff in Geneva at the Office of the United Nations High Commissioner for Human Rights (OHCHR). This will include staff supporting Agnès S. Callamard, the Special Rapporteur on extrajudicial, summary or arbitrary executions where they will raise concerns about the collusion between Thailand and India and explore actions that can be taken against both countries following Harminder Singh’s death. Three others, Gurpreet Singh Gurdaspur, Jagtar Singh Tara and Gurdev Singh Jajja were also deported from Thailand and remain in prison in Indian jails. Following the suspicious death of Harminder Singh there are concerns for the well-being of the other Sikh political prisoners that currently total around 150. Family members of Jagtar Singh Johal, the 31- year old from Dumbarton who has been in custody without charge for 6 months having been abducted on 4 November 2017 will be travelling from the UK and also taking part in the protest rally in Geneva. “The suspicious death of Harminder Singh following medical neglect has direct implications for Jagtar Singh Johal as Indian police have tried to connect them through inadmissible police interrogation videos released to the media”, said the Sikh Federation UK. The Sikh delegation meeting OHCHR staff will include the brother of Jagtar Singh Johal who will be seeking clarification and assurances about actions being taken by the Special Rapporteur on Torture and Other Cruel, Inhuman or Degrading Treatment or Punishment since REDRESS filed an urgent appeal in December 2017.